We started by going up the Village Gondola to the Mid Station and on the magic carpet and the Olympic Chair but quickly became bored. The Olympic Chair run is a decent run to iron out or learn to parallel ski but at this point too slow for just skiing. So we took the Gondola up to the Roundhouse. Took the Ego Bowl down but probably ended up on the Cougar and Jolly Green Giant because Meeta had a wipeout next to the fence line on the right. Ego bowl is steep and too bumpy and none of us liked it. It was a rough start and too steep. Upper Olympic and below were fine. 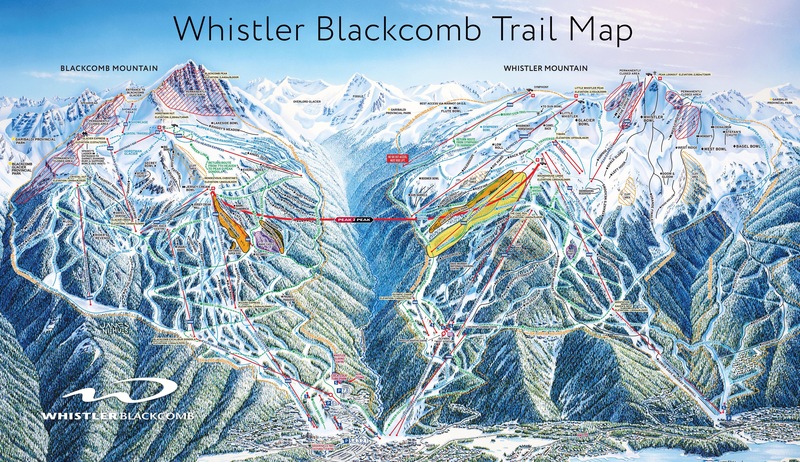 A better route on Whistler is Upper Whiskey Jack to Pig Alley to Lower Ego Bowl and down. On that route after Pig Alley on the left is the entrance to Enchanted Forest which Avinash loves to do but is not good for us because the bumps are very narrow and the end that merged into lower Ego Bowl is very steep and narrow. Another route is Pony Trail to Papoose to Pony Trail to Expressway to Mid Station. Pretty much follow the dotted green Easiest Route. The Bear Club near the Tree Fort is too flat and we needed to drag Avinash a lot. Lower Whiskey Jack is nice and wide and just steep enough to be interesting. Probably our level currently. On the Blackcomb side, we took the Expressway to Easy Out and then right under the Terrain Park and connected to Greenline all the way down. The end of Easy Out is steeper. Another option is to go left after the Terrain Park past the Magic Castle. This is a bit steeper and narrower but is probable more fun that the Greenline. We also heard about Sunset Blvd S a good run but it looks very narrow with cliff on one side.